As you can see, there’s a bit of a learning curve to getting started with your email list. Let’s take a look at the tools you need to run your list. The minimum you need to start building your email list is an email service provider. Your email service provider will provide you with basic forms and templates that you can add to your website using code, and they also allow you send emails to your subscribers. If you want to customize your opt-in forms and have more types of form options, you’ll need a lead capture plugin. There are many options for lead capture plugins and they each have different features. Some of these plugins have a free version, while others are premium and need to be bought outright or have a monthly fee. Starting your email list? What you need to know about the technology behind it. Email Service Providers – Which One Should You Choose? While these companies all perform the same basic function – they allow you to collect email addresses and email your subscribers – the way they do things is slightly different. For example, MailChimp is one of the most popular email marketing service providers because of their freemium service. Using MailChimp, you need to use multiple lists to deliver content upgrades – you’ll need a list for each. If the same subscriber joins multiple lists, MailChimp counts that person as a new subscriber for each list that they’re on. Whereas, in an email service provider like SendinBlue, the free plan allows you to send up to 9,000 emails a month regardless of the number of subscribers you have. Exit Intent – These pop-ups are triggered when your user’s cursor heads to the top of the screen, as if they were about to click away from your site. Click-Summoned Pop-Ups – Click on the text or an image and a pop-up appears. This works well for getting more sign-ups, as people psychologically feel like they’ve already given you a commitment by clicking the button to get the pop-up. Timed Pop-Ups – You don’t want a pop-up to appear as soon as someone lands on your page – a timed one is better. You can set the timer to make the pop-up appear after 30-45 seconds. That way, if someone is still on the page, you know they’ve got a good chance of wanting to hear from you. Ribbon/Top Bar – Adding a top ribbon on your site can help draw attention to special events or sales you’ve got coming up. You could also advertise your lead magnet there. Content locker – You can hide content on your page within an email sign-up form. Once your reader subscribes, the content will be displayed. One quick note, Google made changes to their algorithm in early 2017 to penalize sites that include mobile pop-ups. Welcome gates and pop-ups that cover the content are the main targets of this change. Your lead capture plugin should allow you to disable these pop-ups for mobile users. If you run into any difficulty, contact your plugin’s support. Sumo – This is an all-in-one tool popular for their Welcome Mat, List Builder, and Share apps. Sumo is free for limited versions of the apps and pricing starts at $29/month for the Pro version. Bloom – This plugin allows you to create beautiful opt-in forms with many different triggers, including content lockers, timed pop-ups, and click triggered pop-ups. Bloom is part of the Elegant Themes suite of themes and plugins, prices start at $89/year. OptinMonster – This plugin is popular for A/B testing, exit intent pop-ups, Welcome gate, and floating bar options. Prices start at $9/month, billed annually, for basic features, with more features added to the higher priced plans. Hello Bar – Specializes in top ribbon “announcement” bars that can be used to advertise your latest sale, webinar, or collect email addresses. Hello Bar has a free version that you can use, or upgrade to the Pro plan for $12/month, billed annually, that removes the Hello Bar branding and allows you more targeting options, customized “thank you” messages, and up to 10 bars. Now that you’ve got an email list provider and a means to get people to sign up on your site, what’s next? Segmenting your list allows you to target your readers more personally and tailor your content to them. It will also improve your email marketing results. HubSpot research shows that targeted emails generate an 8% click-through rate compared to general email sends, which only generate 3% click-through rate. That’s almost 3X the number of clicks and means more eyeballs on your sales pages, webinars, and offers. But, what kind of factors can you use to segment your list? One of the easiest ways to segment your list is by interests. Subscribers who sign up for one of your opt-in freebies can be tagged in your email service provider as interested in the subject of your freebie. Using tags helps you tailor your message to your reader and send the right email at the right time. It also helps you avoid sending launch emails to your buyers and can be used to allow your subscribers to opt-out of a launch sequence that they aren’t interested in. Offering freebies to your visitors in exchange for their email list is a great way to get more people to sign up for your emails. But, how do you deliver your freebies? You want to make the process as easy as possible for your reader and as streamlined as possible. Ideally, you want to send the free download link within the confirmation email. If you’re using MailChimp, you can elect to send a Final Welcome Email and include the link to your freebie in this email. Where Should You House Your Freebies? If your freebie is a download, where should you keep it? Should you upload it to your email service provider, keep it on Google Drive, or on your website? The best option will depend on your situation. If you don’t want to use your personal storage space or your website bandwidth, uploading your file to your email service provider is a good option. If you want to provide “living documents” that will be updated often, Google Drive is the perfect option. If you have unlimited bandwidth and storage space and want to create a branded download page for your freebies, uploading your files to your website will work best for you. 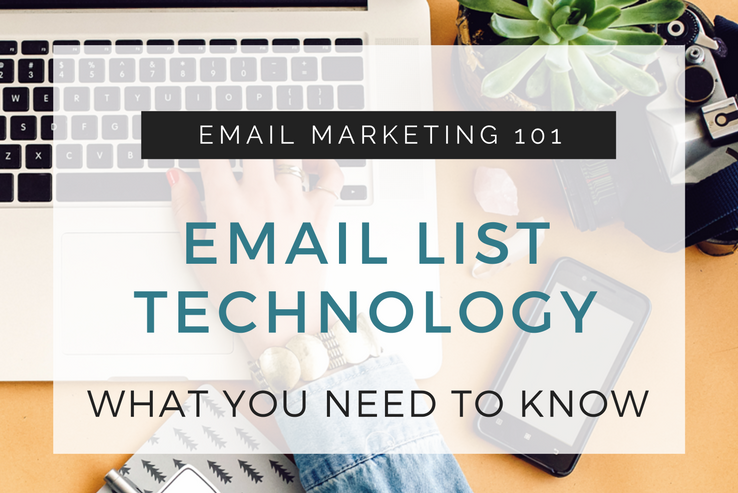 There’s a learning curve involved in mastering the tech you need to grow your email list. But, once you master these skills, you’ll be able to take full advantage of your email service provider’s capabilities to grow your list with engaged and targeted subscribers. Over to you – are you struggling with the tech side of things? Let us know what you’re finding difficult in the comments below.